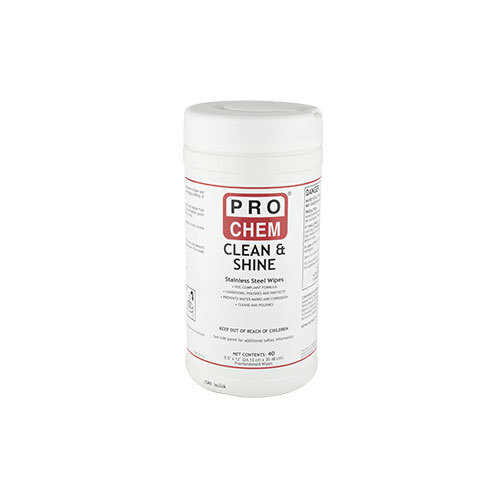 CLEAN & SHINE | Pro Chem, Inc. These one-step stainless steel wipes are premoistened with a unique citrus-based formula designed to clean and polish stainless steel surfaces while protecting them against the damaging effects of oxidation and corrosion. Each wipe will remove hard water stains, grease smudges, oily fingerprints, food spills and residue from virtually any stainless steel surface or appliance. As they clean, they also brighten, polish and protect the surface with a clear coating that acts like a protective shield. The citrus-based formula is safe, effective and versatile enough to remove stains from surfaces like wood, Formica, ceramic and porcelain. Scrub surface with abrasive side of towel until stains and deposits disappear. Use the smooth side to wipe the surface clean. Discard used towel. For a super shine, buff lightly with a soft towel after application.